When it come to wellbeing, the ancient Indian system of Ayurveda is perhaps the oldest philosophy known to man, advocating sound holistic thinking for a advanced way of life, giving health and happiness to the mind, body and soul Ayurveda works by treating the whole person, not just the symptoms and by doing so revolutionising our lifestyle. Through specialist ayurvedic therapies, including sensory massage that works on marma (vital) points in the body, nurturing us physically and spiritually. 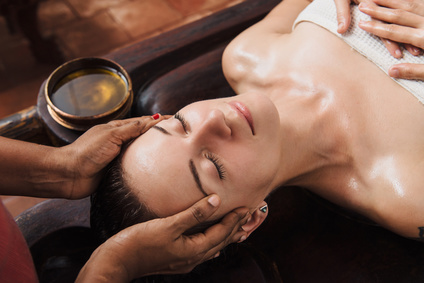 Ayurveda includes combining nutrition, herbal remedies, yoga and massage to heal and nourish your body and spirit. Working on your life energy (Pran Flow) by addressing your Chakras and Nadis. Ayurvedic therapies are designed to work seamlessly into your everyday life, helping you become, and stay, health and happy. Today the best remedies help you look and feel great, which is why Ann has decided to combine teaching yoga and provide Ayurvedic treatments as a complete holistic package to reconnect with your soul and make you feel whole again. Ann will offer one-to-one guidance to map out a lifestyle programme that's perfect for you including: yoga sessions, lessons in meditation and mindfulness, body therapies, the importance of herbs and basic nutrition. The reality is, not everybody is the same and Ayurveda understands this. We establish what kind of body type you are, or 'dosha' as it is known in Sanskrit. There are three types of dosha: vata, pitta and kapha and each one has its own caring and nurturing regime. By recognising the dominant dosha we can compose a treatment that addresses your needs. Leaving you with a grander, fuller version of yourself and in the end you'll arrive at a better place. Feeling more balanced. Ann uses award winning Tri-Dosha products (oils or herb compresses) to provide the treatments. By booking a time slot, it allows you to surrender your experience to our qualified holistic therapist to prescribe which is right for you on that day, The following menu below gives you a brief outline of what treatments are available and the benefits of each are.